USB Type-C has a number of chances to become the standard for data and charging connector for smartphones and tablets running either Android or Windows. However, in the long-term future, Intel wants USB-C to be even more universal (and therefore pervasive) than it is going to be, which is why at IDF Shenzhen part of one of the talks evolved around using Type-C for audio. Audio receptacles on PCs and mobile equipment are virtually the last remaining analog interfaces of modern devices, requiring certain techniques to maintain a high audio quality and remove interference. Intel proposes to replace things like 3.5 mm mini-jack with USB Type-C which will help to add features to headsets and will simplify connections of multi-channel audio equipment to various gadgets. This is not the first time a company has proposed to replace analog audio on PCs and mobile devices, but so far, nobody has succeeded due to the ubiquity of 3.5mm. Since the industry may still not be ready to go all-digital, there seems to be a backup plan. Various types of audio jacks to connect headphones to audio equipment have been around for decades. For example, the original 6.35 mm connector, which is still widely used by audio equipment, was invented in 1878. Meanwhile, two-conductor miniature 3.5 mm audio connector (which is the most widely used audio connector at present) has been around since 1960s. Headphone jacks have evolved; they have gained contacts to support microphones and even basic programmable capabilities to enable remote controls. However, fundamentally, the ability to listen to audio through a speaker has remained the same for over a hundred years: completely analog and barely any smart functionality. Today's smartphones are used for all sorts of different purposes and are connected to a variety of devices, which requires sophisticated interconnection technologies with high data-rates. At the same time, as phones and devices get thinner, or even to simplify some of the internal design, it gets harder to install multiple ports for various purposes. If there were to be a universal connector that does it all, including audio, Intel and some other players want USB Type-C to be that universal connector. In fact, USB-C can be used to transfer analog audio in accordance with the specification of the connector. It all comes down as to how that audio is transmitted. The USB-C has sideband use pins (SBU1 and SBU2) which can be used for analog audio in audio adapter accessory mode. Use of the sideband pins should not impact data transfers and other vital functionality of USB-C cables, which should make them relatively simple from the engineering point of view. In this case, the USB-C connector will just replace the 3.5 mm mini jack and may even gain some additional features, such as a thermal sensor in an earpiece could measure temperature for fitness tracking. The concept is not completely new and we saw it years ago - back in the 2000s, Motorola used the mini-USB connector on its feature phones to enable charging, data transfers and a headset connection. The idea to use one connector for everything was not entirely bad, however, it left users without a choice of headsets. However, if the makers of devices (as well as producers of audio listening equipment) adopt USB-C, the is potential that the problem will not occur again. In the advent of digital signal transfer, this allows the headset to drive the digital-to-analog conversion, removing electronic interference from the host and potentially offering a wide array of audio results. However, transferring analog audio using USB-C’s SBU pins is not the only thing that Intel is working on. At present, Intel is finalizing the USB Type-C Digital Audio technology and plans to release its specification later in Q2. 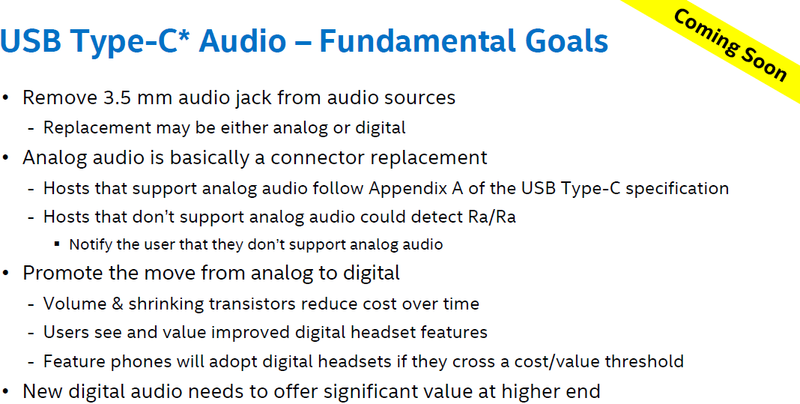 The company does not reveal a lot about the standard right now, but notes that it is working on updating the USB Audio Device Class 2.0 specifications to support new connector, expand the list of recent audio specifications and features, improve power management and simplify the discovery and configuration model to make the upcoming headsets as easy to use as today’s headsets. In fact, one of the important issues with streaming audio over USB is the synchronization of data streams from the host to the receiver. 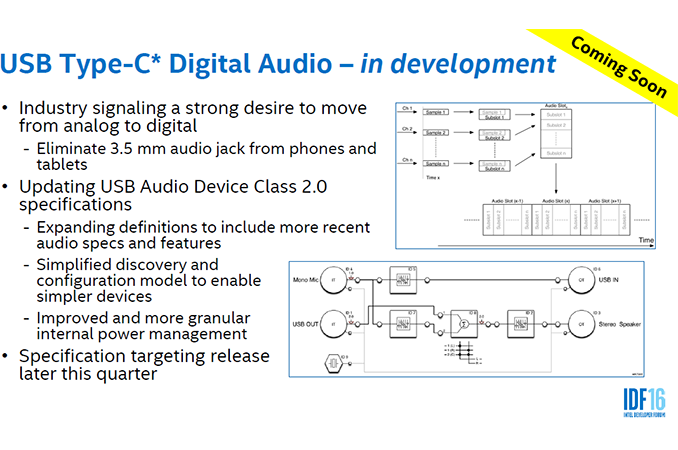 The USB Audio Device Class specification solved the problem in the past and because Intel mentioned the USB Audio Device Class 2.0 in its presentation at IDF, this may mean that the new the USB-C Digital Audio spec will rely on this synchronization mechanism as well. Intel wants its USB-S Digital Audio to be backward-compatible with USB Audio (1.0 and 2.0), but naturally plans to add support for new music formats. Usage of digital audio means that headsets should gain their own amplifiers, DACs and various other logic, which is currently located inside smartphones. Intel proposes to install special multi-function processing units (MPUs), which will perform beam forming, noise suppression, acoustic echo suppression (AES), acoustic echo cancellation (AEC), non-linear processing and other operations. The MPUs will also support HDCP technology, hence, it will not be possible to make digital copies of records using USB-C digital headset outputs. It is unlikely that audio processing will be offloaded to external headsets completely, but the latter will clearly gain their own chips. This may, however, see a spike in cost, especially at the super-low end. A good thing about USB Type-C headsets with MPUs is that they are going to be software upgradeable and could gain functionality over their lifespan. Intel admits that such MPUs will make digital headsets more expensive compared to analog devices, but high volumes and new process technologies will help to reduce the cost of digital headsets over time. In fact, USB Audio headsets and audio chips for them are not something completely new. For example, Plantronics Audio 655 DSP headset costs $49.99, whereas CMedia’s HS-100 chip for headsets is available $1. Therefore, from the cost perspective, digital headphones should not be too much more expensive in general. Meanwhile, Intel wants USB-C digital audio headsets to offer “significant value at higher end” and have improved functionality in a bid to become popular among consumers. The industry has successfully replaced analog cables with HDMI for video equipment in the living room and in the coming years will retire the D-Sub interconnection for computer displays. However, audio jacks have survived multiple generations as other standards have changed. In fact, Intel itself eliminated analog audio jacks in its first-generation NUCs PCs, but had to return them in subsequent generations. With USB-C Digital Audio Intel may not be alone. Google’s Android 5.0 already supports USB DAC devices and thus digital headsets. Moreover, last week LeEco released several smartphones without audio jacks, so, there are attempts to eliminate them from mobile devices already. One maker will not make any difference, but a coordinated move by market leaders, such as Samsung, LG or HTC, could have a significant impact. So replace a 20 cent versatile and widely spread connector with an tremendously more expensive one, which is complete overkill for audio and makes absolutely no sense whatsoever. And seeing how most devices come and will continue to come with just one C port, what do I connect first? Sure, it supports daisy chaining, but I highly doubt many devices will come with a path-through, that will only add to the cost. So you have to carry around external adapters. You'd rather pay like 30$ every time a cable dies on you? And on the headphone side, it will be even harder to replace than a regular stereo analog audio cable, that means throw away the headphones as well. I am curious of the level of electronics knowledge and skill set of an average AT reader. Most of the comments boil down to "woot, new tech, usb-c, must be great, can't wait, pesky old 3.5mm jacks must go". Practically speaking, replacing the 3.5mm jack with usb-c ranks amongst the dumbest things one could possibly do. But it makes a lot of sense commercially. The motivation is one - more profit, and it will come at the expense of consumers.